In order to do a lot of the drainage and waterproofing on the watermill and mill house, we’ve had to dig deep into the clay underneath, which is where we’ve unearthed some mysteries and solved others. To start with, several pockets of clay were found underneath the back wall of the watermill, which explains why so much water was leaking through into the bakery, and why the walls were moving when we started to dig near them. In some places, if the ground had been allowed to dry out, it would have crumbled away-taking the mill with it. Elsewhere, we’ve discovered that apparently the best way to get rid of old quorn stones was to bury them. So far we’ve found two buried near the outbuildings-one will stay in place as a very convenient step and the other was unfortunately broken. 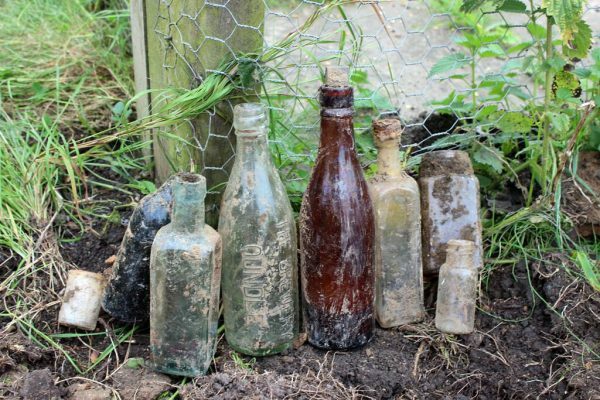 Along with the quorn stones we’ve found several old bottles, two of which are inscribed with: Smith & Co, The Brewery, Oundle. Another still has a stopper in it and something sloshing around inside but so far, none has been brave enough to find out what. This week, staff at Sacrewell had an after-hours tour of the work that has already taken place, and were able to see the plans taking shape. Most interestingly, the top floor of the mill house is almost unrecogniseable, because a shower room for future residents has been built in. Unfortunately, work on the top floor has stalled because a lot of the original floorboards are infested with woodworm. Conservation officers have agreed that they will have to be completely replaced. It was also interesting to hear about the amount of work that has been put into waterproofing the back of the building. It seems a similar tact was taken last time work to the mill was done, about 25 years ago, but only on a small section of the wall near the waterwheel.